Welcome to our Tutorials section! Here you can find all sorts of tutorials covering many things, both basics and advanced stuff. Most of the tutorials listed in this index are hosted right here on the forum, in the tutorials subsection. There are however a couple of tutorials which take you to external sites, like the TR Forge Adventskalender for example, so you won't find these in the form of threads anywhere in the rest of this section. In here you'll find tutorials on a lot of TRLE and TRNG related subjects. The tutorials posted in there can be used with the original TRLE, but also with the NGLE/TRNG! Tutorials that can only be used for TRNG related subjects are listed in this post. Tutorials that can only be used for Dxtre3D related subjects are listed in this post. Some tutorials on different usefull TRLE/TRNG related tools. And last but not least you can find a couple of Flashtutorials in the fifth post of this thread. The RESOURCES and TOOLS have their seperate thread now. Last edited by Titak; 15-11-17 at 13:16. Below is a list of tutorials that can be used when you use the original TRLE for making your game. They can also be used when using NGLE/TRNG. When downloading a custom game from trle.net all you have to do is unzip the downloaded file, find the tomb4.exe withint and double-click that. However, sometimes the readme instructs you set this or that setting in the Setup of the game or you want to make some adjustments, like screen resolution andor texture depth yourself. The little tutorial below is about how to create a shortcut to the game setup. - This tutorial is about installing custom levels when those levels are not playable directly from the downloaded and unzipped folder, like all levels at trle.net are these days. - This tutorial shows the steps you can take from basic initial ideas to actual environments, objects and atmosphere. - Putting together a playable folder is simple and recommended. It means anyone can download your game and simply unzip it, click and play. This is how you do it. - Is your level done? Don't take that for granted. Having it beta tested by others is perhaps the most important phase of any video game's development. - This tutorial teaches you, step by step, the basics of shaping, texturing and lighting a room and making the level playable. - This tutorial teaches you, step by step, the basics of shaping, texturing and lighting a room and placing objects. Tutorials about shaping your level, shaping the rooms. - This tutorial shows you how to build diagonal flat ledges. - "No Collision" is used on triangles to make them non-solid. It is used for diagonal ledges. A simple yet difficult to grasp concept, "no collision" continues to baffle new level builders. Hopefully this tutorial will unravel its mysteries. If you don't understand what overlaps and boxes are or if you have crucial problems with enemies' AI. A couple of tutorials on how to light your level to create a certain atmosphere. - With flipmaps you can change the appearance of a room, like turn it into a water room for example. These tutorials show you how to use them. - Sinks are used to create a current in the water, to either pull Lara along or prevent her from going somewhere. - The Title level is the one that you see behind the New game and load menus before you enter your game. You can create your own custom Title Flyby in the same way you build a normal level, except that this title level is a continuously looped flyby, so it is not playable as such..
- This tutorial teaches you how to set up a "train" level. - Everything you want to know about creating water (both basics and more advanced techniques) and currents. Tutorials on texturing your levels. - A small tutorial on how to use pictures of ordinary things for more alien looking levels. - Some info on animation range and UV-rotating on roomgeometry and objects. - A tutorial on how to make water more realistic by layering textures. We all know the TR4 engine, which is used for the TRLE, is limited. Limited in all sorts of ways but also limited in how much it can render at some given time. *Deleting a "-" from texture ID unflips it faster. - Experiencing a ptich-black blinking of the environment in certain parts of your level? Chances are those rooms have been built in the bottom right corner of the 2D view window in the editor. This tutorial shows you the zone where the blinking starts so it will be easier to stay away from it, without error and trial. - This list contains the OCB codes for the regular TRLE objects. - The extra TRNG OCB codes can be found in NG-Center Reference. - Remember how the Hammer God makes Lara fall off walls? Here's how you do it! - This tutorial is about activating new enemies after others have died. - This tutorial is about the mutant egg setup from the TR1 Atlantean levels. - This tutorial is about the different types of wraiths and how to set them up. 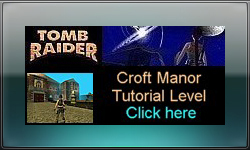 - This tutorial shows you how to use the guide from the TR4 "The Tomb of Seth" level. - The monkey pulling the ceiling-switch. - Tutorial on how to open doors with multiple switches. - This is how to have a number of switches open different doors, depending on which switches you operate, similar to the set up in the Palace Midas level of the original Tomb Raider game. - Tutorial on how to open doors with multiple pickups. - This tutorial tells you how to setup a swingpole, a tightrope and a zipline within the original TRLE. - You don't always have to create ledges for Lara to walk on. Bridge objects can also be made solid so Lara can walk on them. The advantage is that you don't have to stack rooms to get a walkeable ledge. - Raising blocks are one of the most useful and versatile objects in your WAD. They can be used to fill gaps, as doors, raise torches or pushblocks to a higher level, or be lowered to reveal some pickup. - A wad only has three WATERFALL slots. Need more different waterfalls in your level? This tutorial describes how you can do that. - Getting random objecttextures on your waterfall objects? Here's how to fix that. - A tutorial on how to set up the BURNING_FLOOR object from the TR4 "Lost Library" level. - A tutorial on how to set up the ELEMENT_PUZZLE from the TR4 "Mastabas" level. - An example of a puzzle using the lightbeams and mirrors from the TR4 "Tomb of Semerket" level. - The puzzle where you have to use the turnswitch to point the obelisks in the right direction. - This tutorial is about the pyramid puzzle from the TR4 "Cleopatra's Palace" level. - This tutorial and its example project show fully working scales puzzles. - This tutorial shows you how to set up the Sundisk puzzle from the TR4 "Sacred Lake" level. - Tutorial on how to setup the mine(field) detonation like it was used in TR4 Street Bazar. - Flyby camera's can be used for a short cutscene-like scene. The camera's "move". Here's how to use them. - Level jumps are needed to get from one level to the next. These tutorials show you how to do that. - The basic setup for the different types of pickups and how to trigger things when picking up an item. - Placing sound loops into your level can greatly enhance the ambience of your games in a unique and special way. For example, the water loop, waterfall loop and fountain loop placed above and around running water will bring your waterfalls, fountains and rivers to life. In this example we will place a water loop to give the sound of running water..
- Basic info on sfx and audio format. Sound - No sound? Sounds missing? Wrong pitch? - By default Lara remains silent when she takes a pickup object. This simple tutorial will guide you through the process of making her say 'A Ha', when she takes a pickup from the ground and also from a low pedestal. - This tutorial shows you how to change Lara's jumping height and distance. The first part can also be used with teh original TRLE/NGLE, but the second part is TRNG only. - A basic list of ways you can use for making cutscenes. Fun with Shininess and Reflection! - This tutorial is all about applying shine to your objects and the effects you can create with it. - Remember the ledges in TR3 that you can only see when Lara lights a flare, or if a flame reveals them? Well, you can have 'em! - This tutorial show you how to quickly adjust Lara's collisionbox after editing Lara's appearance or when adjusting her animations. .
- This tutorial lists a couple of Lara's imitations like jumping height and distance and fall damage. - The setups for the different types of electric arcs, sparks and lightning effects. - A flat floor that Lara performs her sliding animations on. - Sprites are images used for certain effects ingame, like fire, smoke, water, etc. - This is the complete list of the sprite numbers and for which effect they are used. Textures - Where to get them? - not a tutorial but a thread with links to various texturesites/downloads, including links to various remade classic TR texturesets. - A tutorial on manipulating the camera in such a way that you can take ingame screenshots from different angles. Last edited by Titak; 06-10-18 at 18:28. The tutorials listed below can only be used if you are creating your level using TRNG. TRNG is an updated version of the original TRLE, called NGLE, and it has its own tomb4.exe. TRNG allows for a whole lot of new possibilities for both gameplay and graphics. Remember that when you are using TRNG, you can also use the TRLE tutorials above. 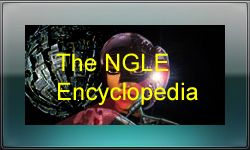 The NGLE Encylopedia by AkyV is a complete NGLE reference manual in pdf format (550Kb). The reference manual was made using TRNG 1.2.2.6. The above link also contains an addendum for TRNG 1.2.2.7. Four levels built with the TRNG which you can study and use. Includes maps, textures and WADs (194Mb). The levels were made by Aza, Bedazzled, Tomb Maker and George Maciver. A level built around Croft Manor for new players so they can learn some of the moves used in custom levels (61Mb). The manor was made by Cowboy and turned into a tutorial by George Maciver. he TRNG script reference manual by AkyV and Stephen Cooper is a complete script reference in PDF format (1.64 MB). TRNG – How to start building a level? - Two tutorials on how to work with animating textures in NGLE/TRNG. - This document is a short introduction to Animation command, with some study in depth of TestPosition command and ENV_ITEM_TEST_POSITION condition. - A list with all of Lara's StateID's and their behaviour. New moves for Lara, interaction with objects other than a regular puzzle- or keyhole, etc. - Make all sorts of new moves possible through scripting. - The tutorial only covers some of the moves that were previously made possible with TREP. - The addendum shows you how you can make Lara grab a diagonal ledge by using parallelbars and TRNG animation scripting. - By default Lara keeps climbing even if a polerope has ended, either above or below the placed poleropes. - This tutorial teaches you how to make poleropes which end, like the poles and stalactites in TRA/TRL/TRU. - This tutorial thread contains multiple examples on how to make Lara interact with objects when she is underwater. - A couple of conditions and commands that have to do with (the volume of) audio and sound. - Change the background audio when Lara enters a different environment in which the audio can't be changed through regular triggering. - The tutorial covers a change of background audio when going underwater. - This same setup can also be used to change other things when entering a certain environment. - Audio can play at two different channels simulateously, volume can be changed, etc. - All WAV formats, MP3 and OGG can now be used. No more converting to the lower quality TRLE wav format needed! - When you’re using an object in the game, sometimes you will hear an unwanted (hardcoded) audio file. This tutorial shows you how to remove that. - Using the new (A41, A45) triggers instead of the classic camera triggers, for static/flyby cameras. - Using the new (A42) trigger instead of the classic TARGET triggers, for static camera targets. - Using new static camera effects, with F119 or F123 triggers. - Using demo cutscene cameras, even out of cutscenes. - Customizing basic (chase, combat, look) cameras. - This tutorial is about creating cutscenes using the cutscene features/triggers. - If you would like to turn Lara's chase camera manually ingame. Change Lara's physics (jumping speed etc), the amount of air in her lungs when underwater, make her scream when on fire, etc. - By default, if Lara falls into a water pool, she will not be harmed if the water (or quicksand) is deep enough. This tutorial is about making her hurt or even kill her when she makes a deep fall into water. - The title says it all... The moveable objects include vehicles, crowbar switch, pulley, falling block, pushable, rope, rollingball, parallel bar, switches. - How to disable different switch types. - Ever noticed how Lara never screams when she's on fire? Well, with this tutorial you now can make her scream! - A tutorial on how to accomplish an AOD style gripbar, with Lara having limited strength. - A tutorial on how to make TR3 style health/healing crystals. - A tutorial on some "hanging" features: on a climbable wall and a couple of things having to do with Lara hanging on a rope. - Ever wanted to adjust the amount of items (flares and weapon ammo's) in Lara's inventory? Here's how to do it through some scripting and the use of variables. - A sweet short tutorial with an example on how to make Lara jump further when she is jumping over a hole with a strong updraft. - If you like the idea that Lara can't move with too many things in her backpack, so she have to drop items if that is too heavy. - Change the amount of time Lara can stay underwater, either decreasing her air faster or slower. - Some things related to Lara's air, dashing, the mechanical scarab and activating things after Lara is dead (before the jump to the menu takes place). - Ever wanted to add sounds to Lara which can NOT be assigned to animations? Sounds that Lara will make when she has a certain status (on fire, low air, low health) Some examples. - A tutorial on how to create the walking setup like it is in the Angel of Darkness game (without having to hold the walk button the whole time while walking). - different things have been posted in this thread. - a tutorial about the different types of collision that are available within TRNG. - With TRNG you can now create different solid shapes for Lara to stand on. You need to use the BRIDGE objects for this. This tutorial shows you how to do this. - The main target of this new collision feature is to permit to Lara to walk, climb or monkey on statics and moveable items. Another usage could be the creation of collisions for the future modelling of 3d room geometry using meta2tr program. - This tutorial is NOT about the animating compass you see in the inventory. This tutorial is about an on-screen compass, using sprites. - Some customizations for human non-playable character: baddy, guide, horseman and Von Croy. - The basics on the Damage= script and an example of a cold waterroom. - The detector object is a new piece of equipment which Lara can use to locate the position of pickups & enemies in real time..
TRNG – Disable keys, except in menus- A frequent problem of TRNG that you want to disable arrows and CTRL with F51 trigger, so Lara can’t move or shoot or else, but it will also disable the keys in menus, so you can’t scroll etc. menus. - Do you want to add credits to the end of your game? Here's how to do it. - fixes the bug that the binoculars are not visible when Lara is looking in a mirror through the binoculars. - 1. Tutorial on how to use the Customize=CUST_FLARE, ** script. - 2. Tutorial about how to add the hissing sound to the flares. - some very interesting stuff about torches and flares in here. - some things regarding the flycheat which you could find usefull in your level. - FMV's can be used with the TRNG engine. This tutorial tells you more about it. - The player hits Key M (M for map) to open the map where the tip of the pointer (i.e. the middle of the little star object) indicates Lara’s actual position. - Lara has limited hanging strength in Angel of Darkness. Here's how you can make it work in TRNG. - With TRNG, we now can change the colours of default tomb4 bars like the air bar, hp bar, loading bar etc with a few simple script commands. - Usefull instructionsheets to help you better organize your TRNG stuff, like the script. 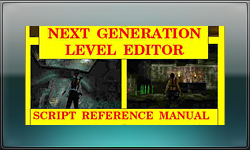 - With TREP and FLEP it is possible to add an extra "Lara's Home" entry to the main menu, kinda like you could select Croft Manor from the Main Menu in TR1-TR3. But it is also possible with just TRNG, using some scripting. The "Lara's Home" (or whatever you want to call it) can't be selected with the cursor: a hotkey is needed. - Remember the statistics screen popping up at the end of a level in TR1, TR2 and TR3? Here's how to create such level endings. - If you have troubles with the proper appearance of these sprites. - Here's how you can have an image as loading screen for a level. - This is a short tutorial to show how you can add a glowing mist ball to an object, for extra effect. - A short but sweat tutorial on how to use the full body mesh swaps properly. - Some stuff you can do with fire. - Special script commands to make the script writing easier. - This tutorial shows you how to make semi-transparant shadows for objects, using statics. - Some customization stuff about the use of MIP slots, the size of the shadow that a moveable casts and the distance at which enemies can detect Lara. - This tutorial tells you how you can make Lara talk to Zip through her headset, just like in the TRCVCI levels. - Some things you can do with Lara's vitality as well as the vitality of enemies. - Table having NGLE buttons, with customized contents. - You’ll be able to use checkpoint type game savings if you follow the description in this tutorial. - a tutorial on how to put Diary, Load Game and Save Game options all in one object, like in TREP. - Tired of the default gamebackground when loading or saving a game? Learn more about the SaveGamePanel here. - This tutorial shows you how to set up the TR3 style savegame crystals. - What is activation and deactivation exactly? And which triggers can or have to be used in the old TRLE and in TRNG. - This tutorial describes how you can make two rollingballs collide and explode when they hit each other. - You can create the illusion that something is hidden inside the rollingballs. - Instead of using flipmaps to change the colour of objects we now can change the colour by scripting a Parameter= command and using a flipeffect to activate it. We can also vary colours between bright and dark, like a pulsing effect. In this tutorial we will see how to do that. The ColorRGB= command will be used to create your desired colour. - This tutorial is about setting up multiple switches and only the specific order in which the switches are used will trigger the event. - This tutorial shows you how to set up a door which has to be opened with a wheelswitch that's attached to the door. Like in TR2 and in TRC, the submarine levels. - This tutorial shows you how to make Lara open a door with two different items, for example with a key but also with a lock-pick. - This tutorial shows how to use the TR5 keypad as a coded switch in base type levels with the option of on screen instructions being given to the player. - With TRNG we now have the power to move statics and moveables with scripts and flipeffects to create some really cool gameplay situations using the PARAMETERS= command. - Some conditions and actions that have to do with the position of an object. - This tutorial is about placing objects and giving them a new position, like switches and pickups not being in the middle of the tile, parallelbars not being in the middle of the tile, etc. - Ever noticed how empty a town that Lara is visiting is? Well, here's how you can make it look populated. - Stuff about the TRNG features regarding pushables. - This tutorial shows you how to get a nearly fully working TR3 Quad Bike in your level. - Stuff about the TRNG features regarding rolling balls. - Customizations for the rollingball (e.g. rolling speeds), teethspikes (e.g. adjust how fast they go up and down) and joby-spikes (e.g. rotating speed and extension length. - Objects can be made to spin without having to animate them. - This tutorial teaches you how to make a pickup item spin. - How to use the sprinkler multiple times and changing the length of the sprikler's effects. - Some basic and some more advanced stuff regarding the use of the torch. - A tutorial about setting up the TRC crowbar pickup (taking it off a wall) using TestPosition= and Animation= scripting. - If you want to use the turn switch freely, without the classic TRLE obelisk+hammer setup. - This tutorial is all about Von Croy. - When you set a trigger in the TRLE/NGLE, it applies to the entire tile. With fragmented triggers you can set the trigger to work in only a specific section of the tile. In this example, Lara performs an animation as soon as she steps on the trigger sector. This means the pickup animation is performed at the edge of the sector and not at the centre where the pickup object is located. - A GlobalTrigger is like a CONDITION trigger. It activates if some event happens in the game. It is a way to trigger (activate) a TriggerGroup without placing a trigger sector in your level in NGLE. - This tutorial is all about the "hidden triggers" in TRNG. "Hidden triggers" are events that can be triggered even when there is not a ready-to-go trigger for it in NGLE. - If you have many moveable objects you want to perform the same operation on, you can group the items into an ItemGroup. You then only need to create a single ItemGroup FLIPEFFECT trigger to have that operation performed on all of those objects at the same time..
- Since you can't overlap special triggers you can't place mutiple condition triggers on one tile. Here's where some scripting comes in. - This tutorial is about how to setup condition triggers in those cases where the trigger-triggerer setup does not work. - Everything about placing pickups in the sarcophacus, and the TRC box, drawer, cupboards and shelves, which are based on the sarciophacus. - This tutorial also tells you how you can use the different types of the"sarcophacus" in one level, using TestPosition. - Native to the TRLE is the ability to pickup ammunition after Lara has used all of a particular type up, with the exception of uzi ammo. For years, players have wanted this very ability for all pickups and it's finally arrived! It even works on Uzi ammo! - A script trigger is a trigger that is created in NGLE but stored in the script and not placed in a level. Putting a trigger in the script can have advantages over placing the trigger in the map. This tutorial shows you how to put them in the script. - This tutorial will show you how to create a switch, key or pickup event without the need for in game triggers. This comes in handy for a variety of things. - When you want to setup a timed sequence of events in your level you can use an Organizer= command in your script. - This tutorial teaches you how to setup the TR2 secret system: find 3 items and get rewarded with inventory items, like ammo and medipacks. - Basic info on the new types of triggers that TRNG has, including the fragmented triggers and the grids you can set with them. - If you want to trigger something only when Lara is at a particular height above a sector you can use a vertical trigger. - A bunch of tutorials dealing with trigger adjustment, identification, working methods, etc. - Customizing the earthquake effect? Here's how to do it! Also includes some conditions that have to do with earthquakes. - Use flipmaps to create a trap. 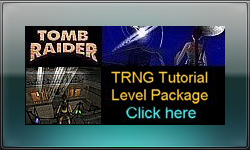 - With TRNG you can make Lara instantly teleport from one place to another within the level. - Lots of information about different types of light effects. - A tutorial about making a PLS work in two ways: an endless one which can be switched on and off at will and one with a limited burning time. - Want to replace the flare with a flashlight? Here's how to do it. - Some things that have to do with the horizon, sky-graphics and lightning. The sky is the limit! - Not strictly a TRNG tutorial but there is a paragraph with specific TRNG stuff in it. - In here is a list of standard Windows fonts which can be used with the WindowsFont script on all computers. - The list is a work in progress and is open for change. - Things you can do with timers. - The default screen timer in TRNG only counts up. But with some triggers you can also make a timer count down. - A bisic tutorial about on screen timers. - The difference between the classic timer and the TRNG timer and how to use them. - Some examples of what you can do with timers. Assaultcourse - Make Lara say different things depending on how much time it took her to complete the timed run on the assault course. - Some customization possibilities for some trap slots. - This tutorial is about using targeting conditions, like "if Lara is targeting enemy in this or that way, then make this or that happen". - A couple of AI related commands and conditions with which you can modify your enemy's behaviour some more. - All you need to know to make your own health bars for your enemies. - Some customization possibilities for the enemy jeep and the enemy submarine. - Some customizations for monsters: mutant, setha, harpy, ahmet, laserhead and hydra. - Some customizations for wraiths, little beetle and fish-emitter. - With the Customize= command we have the ability to do many things. In this tutorial you will be shown how to customize the ammo of the Grenade gun. - Disarm or arm Lara. - The goal of this tutorial is to show you how to set up believable dual Magnums in TRNG. Since we are using the Revolver slot to achieve this, the game will still treat is as one weapon, so Lara will always aim at every enemy with both of her guns, instead of just one, even if the enemy is to the left or right of her. - This tutorial is about using conditions which have to do with Lara's actual weapon and/or the weapon in/on her hands/holsters/back. - This tutorial will show an example for a setup if you want to change clips manually when the ammunition runs out..
- I'm sure that at some point you may have wondered if it's possible to have different weapons share the same ammunition. Well, even if you haven't, it's completely possible! - This tutorial is about turning the dual pistols and uzis into single guns. TRNG - Starting a level with another weapon "activated"
- This tutorial is about starting a level with a weapon other than Lara's default dual pistols. - Under some circumstances, you may want to have certain weapons do varying amounts of damage based on the enemy type, like pistols doing double damage to an organic target, while doing none to a metallic target. This tutorial tells you how to do that. - Things you can do by using fog and ambience light colour conditions. - If you want to use distant fog in your levels, here's how to do it. The tutorial shows you different examples on how to set the density and colour of the fog. - Everythigng there is to know about creating weather: sky and horizon, snow and rain, fog, you name it. Last edited by AkyV; 26-03-19 at 17:47. TREP is the Tomb Raider Engine Patcher. It is a program which can be used to patch the original (or XP-patched) tomb4.exe so you can use new features in your levels. It can not be used with the TRNG tomb4.exe!!!! The tutorials listed below are about animating objects (including Lara) and making cutscenes. Meshtree editing - When to "pop" and when to "push" when building a meshtree. - Each animating object has a meshtree. A meshtree determines the order in which the meshes are placed and how they are connected. - Custom baddies often have their gunflash connected to the worng mesh. In this thread you can find out how to reorganize the baddy's meshtree to reposition the gunflash. - A tutorial on how to use TRW Editor to mirror and transfer animations. Metasequoia (Meta for short) is a program used to edit meshes. So you can use this program to make your own custom objects for your levels, including new outfits and inventory for Lara. Meta - several video tutorials of making objects. - This tutorial is not really a tutorial on how to use Meta. It is more of a "tips and tricks" tutorial on how to make natural looking plants, using Meta and STRPix. Meta2TR can be used to enhance the graphics of your level by exporting all rooms and objects with meta2tr.exe. You can then edit the extracted .MQO files in Metasequoia after which they can be converted again to a new playable tr4. The Meta2TR Homepage has been taken down, but here's an offline version of it. - A tutorial on how to texture objects using the UV Mapping (wrap a texture around an object) method. STRpix is a program used to texture objects, give them lighting (only possible on static objects) and to export/import DFX files for editing in Meta. STRPix is also used for "remapping vertices" which is often needed to make Lara's joint meshes connect to her skin meshes properly. Another feature is the possibility to adjust collision on static objects. - Have you made a new outfit for Lara and now her joints are stretching into infinity? Remapping is needed! But there'smore to it than just renaming vertices. Here's guide about which rules you should take into account. - When using detailled outfit it can be very useful to remap all the vertices to fit the original number. - A simple remapping example. - Flat looking statics? Add highlights and shadows to your statics using the Light Editor. - Oops... Lara can walk straight through your new objects? Here's a tutorial on how to add collision to them. - With Editwad you can export meshes as .MQO files. They won't be textured when you open them in Meta but the textures do stay intact, unlike with .dxf files.- This tutorial shows how you can merge two objects without having to retexture the entire object. Wadmerger allows you to add and remove objects from your levelwad, as well as adding sounds to a wad/object. Wadmerger also has a Sound Manager, Animation Editor, Sprite Editor, Switch Manager and AI Editor. - The basics on how to get an edited object into your wad using WADMerger (to get it into the proper slot) and STRPix (for importing/exporting and texturing the mesh/object). - Note: This tutorial is a bit old but the workflow still applies for the newer versions of WADMerger and STRPix. When using the latest STRPix you can however import textures directly into the wad using STRPix. WADMerger will nto be needed for that part anymore. Also, STRPix can now import/export .MQO files. The texturing on MQO files stays intact when importing/exporting, so you won't have to retexture from scratch each time you make small changes to a mesh. These tutorials show you some tips and trick when it comes to editing images, like textures and fonts, and how to prep textures for use on objects. - This tutorial shows you how to make new font images for use in Leikurri, using Photoshop. - This tutorial shows you how to make new font images for use in Leikurri, using GIMP. TextureAdd is a program which can be used to add new textures to your wad. Last edited by Titak; 23-06-18 at 08:54. Last edited by Titak; 03-09-15 at 14:21. The tutorials listed below can only be used if you are creating your level using Dxtre3D. In this thread i will explain how to fix the bug that can appear in TR2 maps created with Dxtre3D, in which the bubbles emitted by Lara when underwater show as blood. The TR1-2 engines have limited textures per level (TR3 has a wider limit, and so far I haven’t reached it). The maximum is around 2048. Alternate flags are a tool that can help with one of TR1/2/3 biggest limitations: you can only have 1 group of alternate rooms activated/deactivated. All the alternate rooms in a level change at the same time! These flags store the state of an alternate set of rooms, giving the illusion that different alternate groups can be used on a level. And how to use the Dragon boss in a TR2 level! These are my findings after close to 2 years using Dxtre, in relation to object lighting and how to best use it. Last edited by AkyV; 13-04-19 at 10:02.